What better way to show someone how much you care than by sending a personalised poem? Would you like to express your thoughts and emotions perfectly in a poem but don’t know where to start? 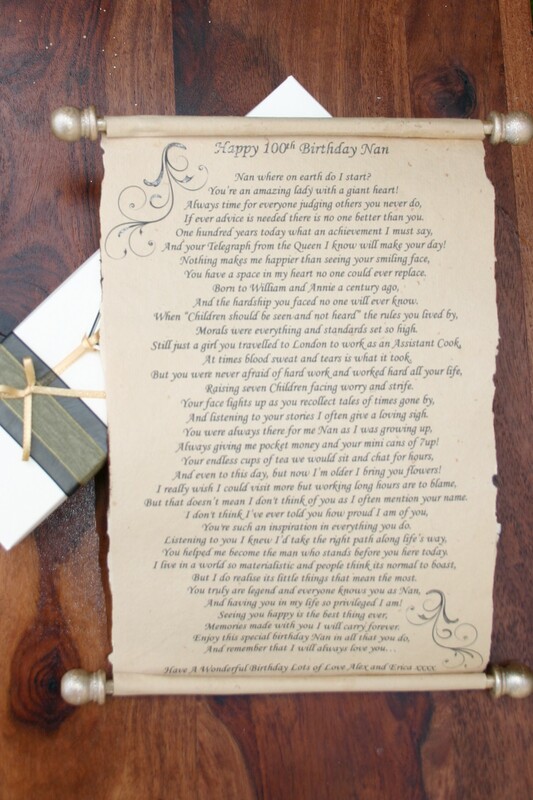 Trinitybox can offer a full service; a personalised poem written specifically for you, and then printed or handwritten onto any of the beautiful gift scrolls. Your poem will be written by a published poet with more than 20 years experience, she has had work published in books and has written for an online company for nearly nine years writing bespoke poems. A lot of her work a few years back, was for British troops in Afghanistan to send to loved ones back home. Her claim to fame was a poem I was asked to write for Kerry Katona for her 30th Birthday, Kerry loved the poem and asked her to write one for her Manager Claire’s birthday the poem was aired and read out on Kerry’s The Next Chapter TV programme. She has written thousands over the years and has had fantastic feedback, she has been known to make the hardest of men cry! All your own words and memories are used and she will add the sentiment and humour to make the poem rhyme and fly off the page! She puts a modern day twist on the poems she writes, they can make you laugh and cry as you read your way through. The perfect gift for Birthdays, Anniversaries, Weddings, Valentine’s Day, Mother’s Day, Father’s Day, Births, Christening, Christmas in fact any occasion imaginable. 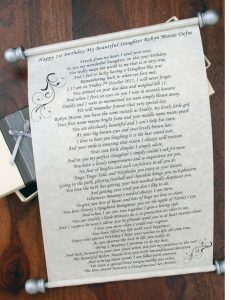 The poems are normally around 26 lines long or can be upgraded to 50 lines. She will send the first draft to you and will work with you until you are one hundred and ten percent happy with the poem. Please email your interest – emma@trinitybox.co.uk. Trinitybox will then email you a questionnaire to complete giving us all the important memories and details we need to write your perfect poem. A Paypal invoice will be sent (along with the questionnaire) which can be paid by debit or credit card if you don’t have a Paypal account. Your draft poem will be ready to view within one week, and you will receive a notification by email. At every step of the way we seek your approval to make sure your end product is the perfect gift. Please note that these prices do not include any of the scrolls, the scroll choice will be discussed after you are completely happy with the poem. There will be a 10% discount given on the scroll price if a poem is commissioned. The shorter 26 line poem should fit onto a small or medium scroll (depending on the font style you choose, as the more ornate fonts take up more room on the scroll) and the 50 line poem on a medium or large scroll.